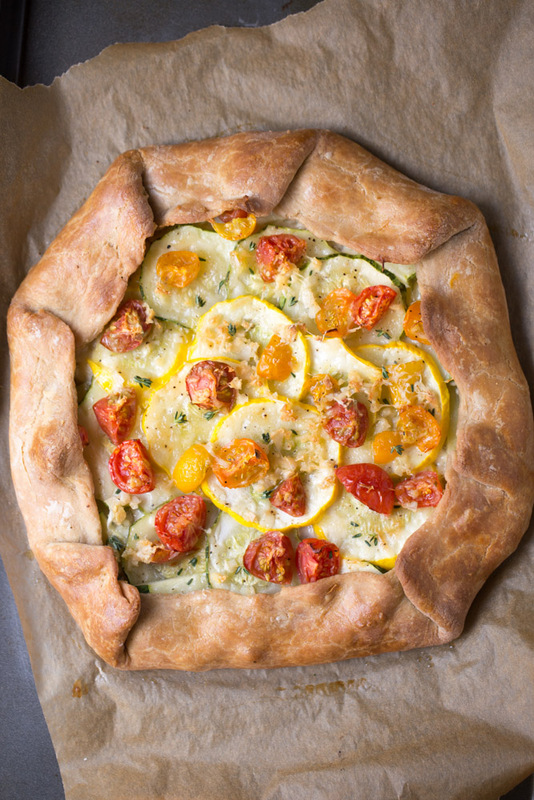 Today we’re talking about this delicious Summer Squash Tart. And farmer’s market shopping, too. On a warm Saturday morning in mid-May, Ken and I spent our time visiting a local farmer’s market and an organic farm. When I say warm, I mean borderline hot. After all, we do live in sunny Florida. We strolled about the market, soaking in the beautiful scenery, eclectic vendors and the aroma of fresh baked foods. We spent much of our time gazing over the bread selections from one of the local bakery vendors. Of course, no bread lover who visits a bakery ever leaves empty handed. We left with a loaf of jalapeño cheddar and a whole grain baguette. On our way home from the market, we visited the organic farm. Kai Kai Farm boasts fresh vegetables that haven’t been touched with even the slightest of chemicals. The for-sale vegetables and herbs line the shelves of the small on-site market. The owners eagerly share cooking methods for each vegetable, should you ask. We filled our bags with beets, kale, broccoli, summer squash and tomatoes. Then we headed home and I made this summer squash tart. Things to know about this summer squash tart. It’s made with locally sourced pattypan and tomatoes, two of summer’s most popular vegetables. It’s made from scratch. Yes, even the crust! First time making a successful pie crust from scratch. This tart made it happen. CHEESE! A modest amount of cheese found it’s way into this tart. It’s great for breakfast, lunch or dinner. Midnight snacking, too. It’s not vegan. See bullet point #4. 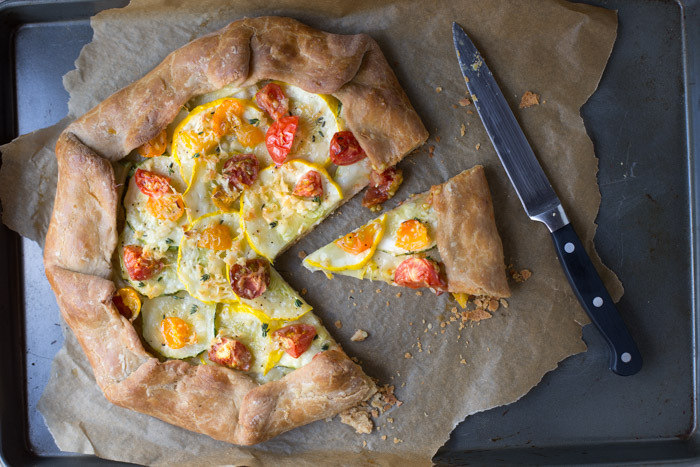 Serve this summer squash tart solo or with a baby greens salad. To reheat the tart, microwave for 30 seconds. In the bowl of a stand mixer, mix together the flours and salt. Add the cold butter and using the flat attachment, beat on medium low speed until the mixture resembles course crumbs and the butter pieces are no larger than pea size. Add the egg yolk and beat until the mixture just comes together. Sprinkle with ice water and mix with your hands until you can form the dough into a ball. Form into a ball and wrap in plastic wrap. Refrigerate for at least one hour. You may refrigerate for up to 2 days or freeze for up to 2 weeks. * Once chilled, sprinkle a countertop and the dough ball with a little flour. Using a rolling pin, start at the center of the dough ball and using light pressure, roll outward, rotating the dough ball as needed. Roll until approximately 12 inches in diameter. Transfer prepared dough to the baking sheet. Sprinkle with mozzarella cheese, leaving a 2 inch border of dough uncovered. Place the pattypan on tart, leaving a 2 inch border of dough uncovered. Top with the tomatoes and then sprinkle with chopped garlic. Drizzle with olive oil. Sprinkle with parmesan cheese. Fold the edge of the dough inward, pleating as needed. Whisk the egg and water together and then brush the outer dough with the egg mixture. Bake at 450 for 20 - 30 minutes or until the crust is golden and the squash is tender. Cool for 10-15 minutes and then slice into 8 slices. Serve alone or with salads. If refrigerating the pie crust for multiple hours, allow to sit at room temperature for 20 minutes before rolling out. Crust adapted from Mark Bittman. (instructions for making the summer squash tart crust with a food processor are available at the link provided). You hit the nail on the head here about bread lovers! Whenever I go by a bakery I always end up leaving with like 15 things I don’t need! I can’t help it, I love carbs! Haha, I love carbs too. Especially fresh baked bread! Love love this rustic tart!! This tart is so gorgeous, Julie! I love all the fresh summer veggies in here! Thanks Kelly! Glad you like it. I need to get more local fresh summer veggies stat. Unfortunately, my favorite farm where I got these is closed until Fall. Looking forward to fall! Thanks so much, Maureen! I need to get my hands on more pattypan so I can make this tart again! What a beautiful tart! I need to make this asap! This looks phenomenal! Given the amount of water that’s usually in squashes, how does the crust hold up? Have you ever had to salt the pattypan squashes to get rid of some of their water content?